Curious? Try making your own…here is the recipe. 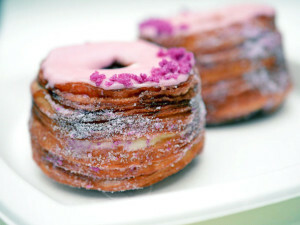 The Cronut, sold at Dominique Ansel Bakery in SoHo, NYC, is a cross between a croissant and a donut. It is made from a croissant-like dough that’s fried in grape-seed oil. Then the baker inserts a creamy filling in the middle. Finally, the Cronut’s rolled in sugar, then the top is glazed with frosting flavors like rose vanilla or lemon maple. Place yeast into the mixing bowl of a large stand mixer. Whisk in warm water and let stand until a creamy foam forms on top, about 5 minutes. Add salt, sugar, milk, 2 tablespoons melted butter, vanilla extract, egg, and nutmeg. Whisk mixture thoroughly. Pour flour on top of liquid ingredients. Place mixing bowl onto mixer. Attach dough hook to mixer and knead on low speed until dough comes together in a ball and becomes soft and sticky, about 3 minutes. Dough will stick to the hook and pull away from the side of the bowl. Transfer dough to a floured work surface, knead 2 or 3 times, and shape into a ball. Wrap dough in plastic and refrigerate for 20 minutes to let gluten relax. Remove dough from refrigerator, unwrap, and dust lightly with flour. Roll out into a 9×18-inch rectangle about 1/4 inch thick. Evenly spread 6 tablespoons softened unsalted butter onto the middle third of the dough. Fold one unbuttered third over the buttered third and press lightly; spread remaining 6 tablespoons of unsalted button on top of that third. Fold remaining third over the first (buttered) third. Transfer dough onto a sheet pan, cover lightly with plastic wrap and a kitchen towel, and refrigerate 20 to 30 more minutes for butter to become firm. Sprinkle dough lightly with flour as you work if it becomes sticky. Return dough to floured work surface and pat very gently into an 8×14 rectangle about 1/2-inch thick. Fold outer thirds over center third as before; roll out into an 8×14-inch rectangle again. Keep edges of rectangle as straight as possible. Fold in thirds as before. Cover dough lightly with a kitchen towel, and refrigerate for 2 hours. Roll the dough out to about 3/8 inch thick. Cut dough in half crosswise. Leave half on a lightly floured work surface; refrigerate other half of dough until needed. Use a sharp 3-inch circular cutter to cut 8 circles of dough from piece on the work surface. Use 1-inch size cutter to cut the donut holes out of the dough circles. Line a baking sheet with waxed paper and sprinkle lightly with flour. Arrange cronuts and holes onto prepared baking sheet. Let rise in a draft-free, warm place (such as an unheated oven) until doubled in size, about 1 hour. Once dough has been made, cut, and dough has risen continue on to fry and glaze your homemade cronuts. Heat vegetable oil in a deep fryer or a deep saucepan over medium heat to 350 degrees F (175 degrees C). Carefully lift a cronut and gently drop into oil. Fry 2 at a time until golden brown, 1 1/2 to 2 minutes per side. Cronuts will puff up as they cook. Drain on racks over paper towels; let cool. Whisk confectioners’ sugar, milk, and vanilla extract in a shallow bowl until glaze is smooth and slightly runny. Pick up a fried cronut and gently dip the top in glaze; return to rack and let stand until glaze has set, about 15 minutes. Alternate version: For higher-rising cronuts, roll out finished dough (see Part I) into an 8×12 inch rectangle. Fold dough in thirds and roll out into a rectangle about 3/4 inch thick. Cut out 6 cronuts and holes, using a 3-inch round cutter and a 1-inch small hole cutter. Line baking sheet with waxed paper and dust paper lightly with flour. Place cronuts and holes onto prepared baking sheet and let rise in a draft-free place until doubled, about 1 hour. Carefully pick up and gently drop cronuts, 2 at a time, into the preheated oil. Fry 1 1/2 to 2 minutes per side. The extra fold and making the dough thicker will result in taller cronuts than before. Let fried cronuts drain on racks. Dip tops of cronuts in glaze as described above, and let cool on racks to let glaze set up.